Fairlands Valley Spartans won GOLD, SILVER and BRONZE medals at the County 5K championships on Wednesday night. On a flat, two-and-a-half lap course lit by street lights BRIAN WHITE won GOLD in the men 60 plus category with a tremendous time of 18 minutes 53 seconds, equivalent to 85.7% on age standard. Scoring exactly the same in the same category BARRY OSBORNE took BRONZE with 19:28. DAVID RIDDELL won SILVER in the 50 plus contest but it took a new personal best (PB) of 17:55, an improvement of 12 seconds, to do it. STEFFAN FORD 14th overall in 17:40; David Riddell; Brian White and Barry Osborne won BRONZE in the County team championships for veterans (all over 40). There were more Spartan personal bests. STEVE GREEN was chuffed to find that despite having tired legs and a cold he got a one second PB, to 19:32; KEN JUDE took off 27 seconds to 22:21; CAROLE SHELDRICK was delighted to squeak off two seconds to 25:06; JENNY GARRETT removed a 1 minute 17 seconds chunk with 25:19; ERICA GRAYSON was hoping to break the 27 minute barrier and was a very happy Spartan with 26 minutes 34 seconds. ROSIE INGRAM ran her first 5K with the club, and it only took 23 minutes 42 seconds. PAUL HOLGATE was very pleased with his run. It was his fastest Hatfield 5K, he has run 10 of the 11 races since it began in 2014, and his fastest of 33 5K races since 2012. There were also season’s bests by KIERAN FEETHAM (20:17); DANIEL SUTTON (21:44) and SHARON CROWLEY (26:54). MICHELLE REEVES and STEPHANIE MAYFIELD were running their first 5K races in 2017. Michelle finished in 21:07. She was fifth senior female (under 35) and Steph came in with 27:53. A good Spartan turnout was completed by RICHARD SPRINGALL (18:33); MARK COLLINS (19:10); VERITY FISHER (24:04); JIM BROWN (24:29); CALLIE CHAPMAN (26:28); and ANDREA WESTCOTT (26:48). 97 Michelle REEVES FS 21:07 69.6% First in 2017. 5th FS. Second claim Spartan NUALA ROBINSON was third senior woman in 21 minutes 1 second. VICTORIA BRETT and CLAIRE HYDE enjoyed the Olympic Park 10K. Victoria ran a new PB of 51 minutes 55 seconds, a 1 minute 53 seconds improvement) and Claire reduced her PB by a massive 4 minutes 35 seconds to 52:11. JENNY PAUL ran the undulating Rutland Half on Sunday. Her chip time of 2:09:15 gave her 10th in her age category. Karen Liddle, Trudie Molloy and Barry King completed the Royston Heath trail half marathon on Sunday in 2 hours 49 minutes 39 seconds. The very hilly course was perfect training for the Snowdonia marathon at the end of October in which the team are competing. In very wet muddy conditions the Spartans were very happy with their run. On Sunday, TIM ROBINSON and ROGER BIGGS ran the Ouse Valley Marathon. A point to point trail marathon that follows the Ouse Valley Way from Earith, near St Ives and finishes in St Neots. While very flat, the course was very lumpy, and quite muddy in places. This is only the second year the event has been held and is proving to be very popular, a small friendly club run marathon. Tim’s marathon preparation hasn’t been optimal and he finished in 5:00:44. Roger came in with 6:26:52. JOHN NELMS ran the Dorney Lake Challenge on Thursday. Organised by runningmiles.co.uk it was a six hour event on a 2.62 mile out and back course – how many laps can you complete in the time limit? John did the marathon distance in just over four hours. The course is flat, tarmac and traffic free through the grounds of the Eton College rowing club. There was a fantastic buffet at the check point every lap and a goody bag full of chocolate at the finish. Four life time and one year’s best for the seven Spartans racing the Greater Cambridge 10K on Sunday plus a second place and a fantastic comeback from serious injury. STEFFAN FORD was second veteran and 18th overall in 36 minutes 54 seconds. TIM SABAN beat the 40 minute barrier for the first time with 39:56; KEN JUDE took 1:40 of his personal best with 47:47; LEE PICKERSGILL was first time under 50 with 49:08 and CAROLE SHELDRICK ran a new PB of 54:22. JIM BROWN ran his fastest 10K of the year with 48:21 and there was an amazing return from serious injury by KAREN BROOM who completed the event in 1 hour 3 minutes 50 seconds. Twelve Spartans competed in this the largest half marathon in the world! The fastest was CHRIS TILLBROOK in 1:27:31. He was 557th out of more than 35,000 finishers. RICHARD KENNEDY came in with 1:33:57 and NICOLA KENNEDY with 1:41:49; ANDREW SMITH with 2:00:10; SOPH GEORGIOU with 2:17:50; club secretary KAREN PALMER with 2:20:24; CAROLINE CROFT with 2:20:25 and TRACY STILES with 2:40:44. BRIAN WHITE has competed in the London Duathlon for many years and this time achieved a course best of 2 hours 29 minutes 33 seconds. That’s run 1 of 10K in 40:27; bike of 44K in 1:24:19 and run 2 of 5K in 21:01. He was first veteran 60 plus in the event which was held in Richmond Park. RICHARD BRUCE took the honours for fastest Spartan parkrunner of the weekend when he finished 8th at the fast layout in Bedford in a time of 19 mins 03 secs. CLAIRE PULLEN was the fastest Spartan woman in a parkrun, finishing 4th at Stevenage in a time of 22:53. KERSTEN WINER was 7th in a new course PB of 24:33 and JULIE SHADBOLT was 10th woman over the line in 26:12, also a new course best. They were joined by VERITY FISHER (22nd in 27:19), TRACY PEZ (30th in 28:16), SALLY PHILLIPS (29:54) and CLAIRE EMMERSON (43:14 as a VI guide for the event). For the men at Stevenage BARRY OSBORNE was the first Spartan finisher, 33rd in 22:58. He was closely followed by MARTIN DUDLEY (35th in 23:04) with LEE PICKERSGILL 3rd Spartan in a new course PB of 23:30. There was also a new course best for SIMON SYPULA finishing in 24:34. 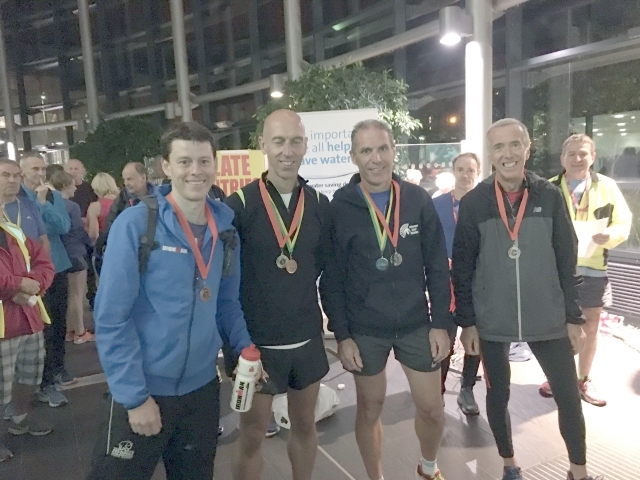 Others running were JOHN NELMS (23:31), CLIVE CANNON (23:50), DANIEL SUTTON (24:26), ANDY PRIOR (24:34), DAVID SCOTT (25:05), PAUL HOLGATE (27:14), JAMES SOUTH (27:42), MICHAEL O’KEEFE (27:53), ROGER BIGGS (30:24) and JOHN WALSH (30:54). Elsewhere TIM ROBINSON went to Oak Hill and ran 25:36, while MARK BEASLEY was 14th at Westmill in 23:30. JOHN ROXBOROUGH finished in 23:33 at Congleton, and DARYL STEVEN was at Brockenhurst to complete in 40:17. Finally HAZEL CLARK was 24th at Fell Foot in Newby Bridge in a time of 28:29.